MEL Consultants Pty Ltd (MEL) is a wind engineering consultancy specialising in determining wind effects on buildings, structures, and the environment. The company was founded in 1981 by Bill Melbourne to provide expert wind engineering advice to engineers, planners, architects and building developers. Prior to the formation of MEL, Bill Melbourne provided expert wind engineering advice as an individual dating back to 1967. The basis for MEL's work stems from over 50 years of research performed by Emeritus Professor Melbourne and MEL Consultants' staff. MEL Consulants Pty Ltd prides itself with a strong research base, with staff members actively contributing to world conferences and journals in the areas of wind engineering and bluff body aerodynamics. MEL Consultants Pty Ltd has wind tunnels at its South Oakleigh laboratory and also works in conjunction with the wind tunnel facilties at Monash University, when appropriate. MEL Consultants Pty Ltd has a permanent staff of five engineers supported by ten technicians that maintain the wind-tunnel testing and data-reduction facilities. Three of our principle staff members have international profiles, as Chair of the ISO Code committee, Board Member of the International Association for Wind Engineering and the Applied Technology Council, as well as a past Chair of the quadrennial International Conference on Wind Engineering and Past President of the American Association for Wind Engineering. Since 1970 a majority of structures in Australia and some in New Zealand, Asia, Europe and North America have had their wind engineering studies carried out by MEL Consultants Pty Ltd. Much of the advice given is by the way of preliminary desktop studies of environmental wind conditions or estimates of wind loadings on structures and cladding and building response. 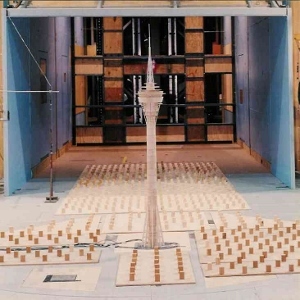 Each year a number of these studies progress to the stage of conducting wind-tunnel studies using physical models and the provision of design wind load or velocity data. A list of major projects in Australia and the World is provided on this website and MEL brochures. These include over 100 tall buildings (some "supertall" at 300+ m or "megatall" at 600+ m), 12 large stadium buildings (including fully operable roof systems), 6 tall freestanding towers, 7 bridges, 2 offshore platforms and many other major industrial and smaller buildings, and some unusal structures such as ships, photovoltaic arrays, and full-scale facade components. - guidance on when a wind-tunnel test would be cost effective. We will not recommend a wind-tunnel test unless there is significant cost or risk benefit.